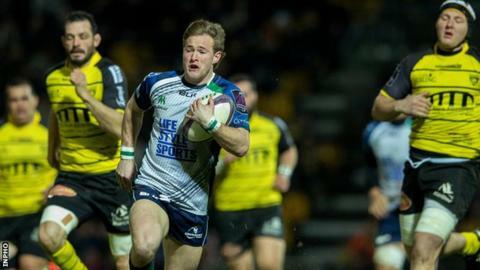 Connacht have clinched a place in the Challenge Cup quarter-finals after a thrilling Pool 2 bonus-point win over La Rochelle in France. Keith Marmion scored an early try for the Irish side but the hosts went in 20-11 ahead at the break after a penalty try and Albian Meron touchdown. Eoin McKeon's try started the comeback with late tries from Niki Adeolokun and Matt Healy securing victory. Connacht go through to the last eight as one of the three best runners-up. La Rochelle: Alofa, Cestaro, Bouldoire, Roudil, Cler, Barraque, Berger, Pelo, Forbes, Borrust, Cedaro, Tanguy, Guyot, Djebaili, Meron. Replacements: Vulivuli for Alofa (66), Fortassin for Bouldoire (55), Audy for Berger (41), Vaslin for Pelo (68). Not Used: Kaulashvilli, Atonio, Kieft, Goujon. Connacht: Muliaina, D. Leader, Poolman, Finn, Healy, Carty, Marmion, Loughney, McCartney, White, Roux, Browne, E. McKeon, Faloon, Naoupu, Muldoon. Replacements: Adeolokun for Muliaina (74), Blade for Marmion (51), J. Cooney for Loughney (41), Heffernan for McCartney (69), Qualter for Browne (64), Muldoon for Faloon (14), Bealham for Muldoon (28). Not Used: Nikora.